Morley describes the ‘disappointed Sublime” as thwarted transcendence, particularly in relation to mass culture where sublime effects are routinely produced in the form of “consumerist pseudo-sublimity which may often seem to place the sublime beyond the reach of authentic experience.” My own experience has been more than being disappointed in the expectation of wonderful view and awe-inspiring experience but of experiencing the awe and then not feeling anything on a second visit – as happened to me in Venice. There’s also this perceived inability to ‘capture’ the wonder of landscape – indeed how can the gestalt of that experience be conveyed in a 2D print? “You can’t possess a landscape and you can’t possess a place” – I identified with this statement in an interview in Lens Culture with Ana Samoylova an artist who is interested in how we process and internalize images. She describes how she had never visited America before moving there so her main visuals of it came from photographers like Ansel Adams. When she visited Yosemite she was shocked because she had imagined ‘grand, high-contrast, black and white mountains, but what you see is more like Stephen Shore or a Roger Minick photo’. Photographs of places like Yosemite, ‘start to repeat each other’s compositions, which solidifies an idea of the place in your mind, even if it doesn’t actually look that way in person’. In her series “Landscape Sublime” Samoylova builds a new landscape constructed through her own experience, using fragments of unfamiliar photographs to construct abstract sculptures which glow with colour and light. Interestingly, she also describes being in Provence recently which was so beautiful that she couldn’t distance herself enough from the pleasure of the experience, “So I ended up with a bunch of postcard-like pictures of lavender fields that simply fall short of transcribing the dizzying aroma of the humble little flowers, the buzzing of bees, or the fading amber sun”. So reassuring for me thought that even an experienced professional photographer can fall into the same trap! 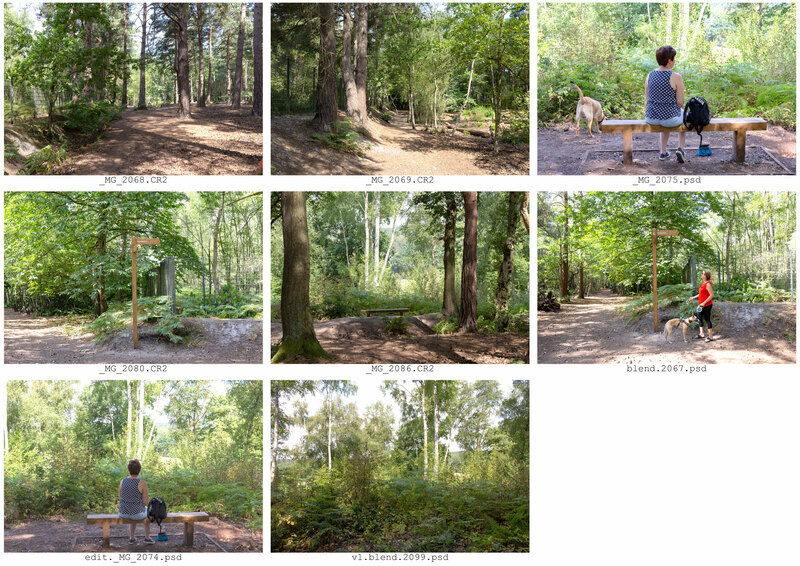 This project began when I paid closer attention to a signpost in the woods pointing the way to ‘Viewpoint’. I’ve already written here about my original thoughts on assignment 1 and the beginning dialogue with my tutor. A bright day with pale sky over darker, dappled woods – a challenging dynamic range. Two ladies agreed to maintain their pose as they and I were looking for a viewpoint. The viewpoint bench was installed at the beginning of last year at a time when the foliage had been trimmed so there was a view of the grounds of the private golf club below. Now the foliage has grown back and the view is of wispy shrubs in the foreground. My first idea was to have a large print of what could, hopefully, be considered a ‘sublime’ image so on my next visit I took an A2 size piece of card to see if there was a way I could fasten a print with string and clips. However, the shrubby foliage was too weak for this. The ground directly in front is rocky, uneven and variously sloping as well so not entirely suitable for some kind of frame (especially bearing in mind my previous ‘accident’ in our garden with the backdrop frame. The next idea was to use a Claude Mirror . This type of mirror is more identified with the Picturesque Movement, but I was at a stage where I was prepared to compromise. You can certainly see the form/structure of the trees but it really is too dark. I could just have well as used my variable ND filter over my lens again even though that wouldn’t have brought my hand into the frame. I also tried a prism which gave some interesting results and almost-rainbows. I used a touch of high-pass filter with a soft-light layer adjustment to add more punch but, again, I was disappointed with the results. My next thought was to provide my viewer with a different ‘viewpoint’ through composite layers. At first I attempted to do this including my spectator but it proved too complicated for me at this stage so I concentrated on introducing just a different view using images of waterfalls. For this I used a blended image created to balance out the high-dynamic range on a summer’s day in the wood. The more sedate Cascade in nearby Windsor Great Park here in the UK. It was at this point that I decided to get in touch with my tutor to give her an update on my (non) progress because I didn’t feel as if I was getting anywhere. 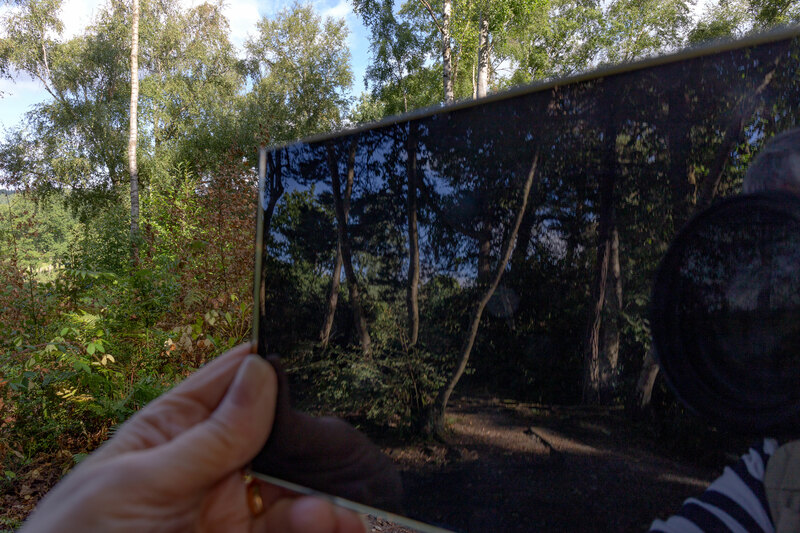 Encouraged by her suggestions I decided to change tack, as suggested and see if I could discover more ‘interrupted’ viewpoints and/or viewers with the thought that Windsor Great Park might provide inspiration. I couldn’t believe it! I know it’s been hot, but it had rained recently. The Virginia Water Lake is still there but the Cascade was dry. I thought I’d try the Roman Ruins instead. I’ve only been there once before and was amazed at the gall of ‘stealing’ from antiquity and not only that but mixing the remains in with stones from elsewhere. Completely fabricated just to provide a ‘picturesque view’. Why should that bother me though – we’re always making something out of nothing to provide spectacle and entertainment. With hope in my heart, and after some more rain, I went back to the Cascade a couple of weeks later. Still dry! I am still interested in the idea of ‘back’ portraits within landscape but there needs to be more to them – a closer view, something more enmeshed. I do feel inhibited about taking such photographs – it seems sneaky somehow and I felt better about it at the beginning when I actually asked someone if they could stay in place so I could take a photograph. That could well be a good way forward for me as and when I’ve devised a more complete strategy. This won’t be for Assignment 1 though as I need to get this completed as soon as possible. My fail-safe has been to begin another project on an entirely different subject which doesn’t depend on the weather or people. This entry was posted in A Possibility: Viewpoint on September 21, 2018 by Catherine.